Note: Please provide appropriate ID when asking for discounts (e.g. Student card, Superannuitant Card). Special prices may apply at times to Film Festivals, Gala Openings and other Special Screenings. Movie Gift Cards may be purchased from State Cinemas Nelson. You can load your gift card with any amount between $20.00 and $1000.00. Cards can be purchased at the Box Office or over the phone on (03) 5483 885. Staff are happy to post your gift for you (a $2 postage and handling fee applies). Movie Gift Cards can be redeemed at the Box Office at State Cinemas Nelson but cannot be redeemed by phone or internet booking. 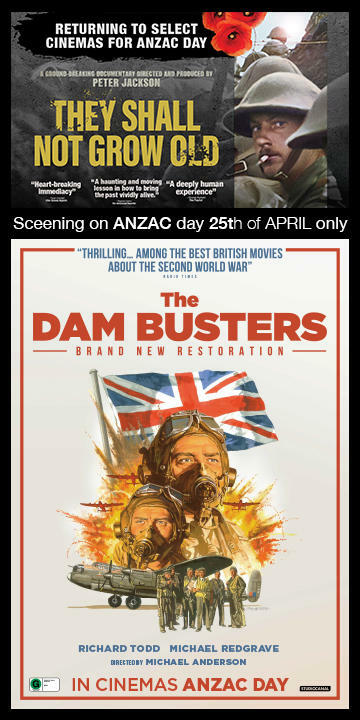 State Cinemas Adult, Child and Senior Vouchers can be redeemed at State Cinemas Nelson. A surcharge will apply when redeeming gift vouchers for 3D films. Vouchers can not be redeemed by phone or by internet bookings. Credit Card bookings can be made over the phone to reserve your seat. It is recommended you book your seats in the School Holiday period to save disappointment. 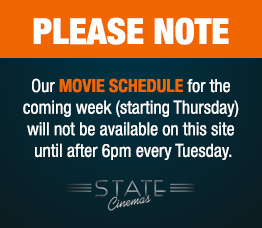 Use your web browser (State Cinemas Nelson and the Suter Cinema only) - click on your preferred session time. This will take you through a seat selection process which enables you to select your own seats. For this service there are charges up to $4 per booking. Booked tickets are held at the cinema counter for collection or use your booking reference number or credit card to collect your pre-booked tickets from one of our Self Ticketing Kiosks in the foyer . Please present your credit card used to make the booking when picking up your tickets from the front counter. For any movie session programmed into the ticketing system. Suter bookings can be made at the State Cinemas Nelson counter outside Suter Cinema hours. Motueka counter bookings must be made at the State Cinema Motueka counter. All cell phones should be switched off or to 'volume off' while in cinemas. If you attempt to use a recording device while in a cinema, you consent to your immediate removal from the theatre and forfeiture of the device and its contents. Chick Flick Vouchers are available. For only $20.50 you can attend our selected Chick Flick on a Thursday evening (after 5pm) and choose a delicious glass of wine, beer or juice from Stefano's Chick Flick Drinks Menu. These vouchers are valid for 6 months and only redeemable at State Cinemas Nelson. Please visit the News and Special events page for what's on! Please ask at the box office about our Closed Captions Reader system. The Readers show text on a screen that fits into the cupholder on the cinema seat. You watch the big screen and follow the captions on the smaller screen below that will be set up for your best viewing experience. To find out which movies are provided with Closed Captions look for [CC] next to the movie title. For security and safety reasons it is our policy to not allow large bags or backpacks into our cinemas. Our staff can store these for you in a locked room. While we are confident your belongings are safe we will not accept responsibility should items go missing. Please do not bring valuables with you.